In the sequel to No Space in Time, The Unfathomable manipulates the awakened Melgor Erdin in an effort to undo the damage done to the omnicontinuum by his previous experiments. Transported from world to world, Melgor Erdin follows the consequences of his actions down the time-lines and loops of disparate worlds towards the end of the universe. "For the Universe to end, yet the central characters to survive, is perhaps, the ultimate cliff-hanger. It's also a scene, a situation, filled with Sense of Wonder stretched to its effective ultimate, an extreme of wish fulfilment. Yet, right till we share with the novel's heroes their vigil in the topmost chamber of a monstrously tall tower that somehow stands outside time and space and watch with them that final fade to black outside, this novel is a roller-coaster of Sense of Wonder. Here are places where time plays every trick you can imagine, in one static, in another running backwards, in a third casually leaping the eras, society thrown from ripe maturity to decay far beyond decadence in an instant, yet in another travelling two ways simultaneously at right angles. The reader discovers a world where a monstrous sentient green fog, reached at last by a mega-bridge from the ring planet that surrounds it, turns itself to clones of all who have come to it. On another, the elderly rule forever by manipulating a never ending conspiracy of the young against them. On a third, a mighty wall separates a gentle, civilised society of females from the harshly tyrannical theocracy of a men-only state, these and other extraordinary environments are made vividly real. Into everywhere, chaotic time disruption erupts, triggered by the figure of Melgor Erdin. He should not exist, but does. Born of a being that split itself into two to bear a child, he has been sealed in sleep for millennia in the Hall of the Transcender by the rulers of all, in an attempt to defuse the catastrophic effects of their mistake in allowing his birth. Yet those effects continue to spread. In their desperation, these masters reawaken him, and send him on mission after mission across time and space. In the perilous journeyings that result he finds again a love lost to him across the ages, and gathers a team of chaos-refugees as unimaginably diverse as the worlds from which he saves them, to aid him in the desperate task of restoring stability and order to all times, dimensions and spaces. The varied band at last find a haven in the Transcender Hall, until that illusory temporary safety also betrays them, and only one refuge remains, the Tower that was Melgor Erdin's prison for so long. This story, like its predecessor, No Space In Time, is a genuine page-turner, plenty of action making full use of those Sense of Wonder worldscapes; in hindsight, the characters may not have as many dimensions as the universe whose manipulations they strive against, but that doesn't hinder this being a real 'good read'. 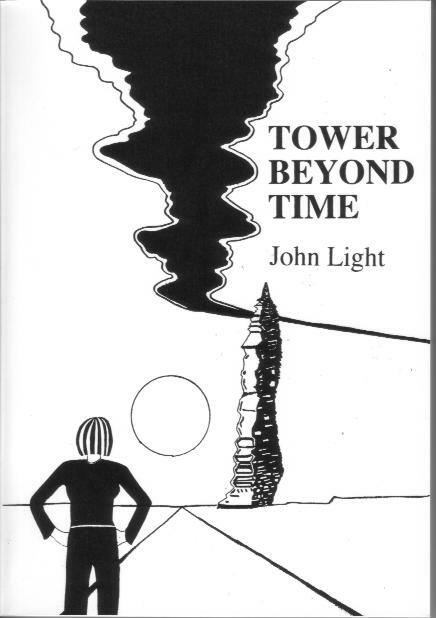 Although it's not necessary, incidentally, to have read the first in the series to enjoy Tower Beyond Time, I would recommend getting both (No Space In Time is same price, same publisher): the adventures of Melgor Erdin, once reawakened, gain added depth by knowing what led to his aeons of enforced hibernation."